Alfred Hitchcock was an advocate of visual storytelling. “Pure cinema” is what he called it. He wasn’t keen on movies that relied heavily on dialogue: Hitchcock cheekily referred to them as “photographs of people talking” (1). In spite of Arnheim’s misgivings, the talkies quickly became the norm. Did they erode the visual power of the movies in the way Arnheim dreaded? Of course not, most film lovers would answer. Filmmakers today are just as visually inventive as during any period of the movies’ history. But maybe those explicative lines of dialogue have lessened the need for a creative mise-en-scène? Maybe directors rely more readily on talking characters to do the explaining instead of relaying info by meticulously visualizing the drama? If you ask us, Sidney Lumet proves to be a visually gifted director. He most certainly did not cut corners when it came to staging this long debate: his blocking is always inspired and makes the power plays crystal clear. In this eloquent feature film, a perfectly fine silent short is hiding. That wordless short puts to rest Rudolf Arnheim’s pessimism: dialogue didn’t sound the death knell for film as a visual art. Not in this case, anyway. (5) We have a feeling even Alfred Hitchcock would have liked these “photographs of talking jurors”. If you prefer a verbose analysis, then this might be more to your liking. We also did the reverse exercise: cutting out everything but the dialogue, so to speak. That leaves you with only words, and we ran them through a wordcloud generator. 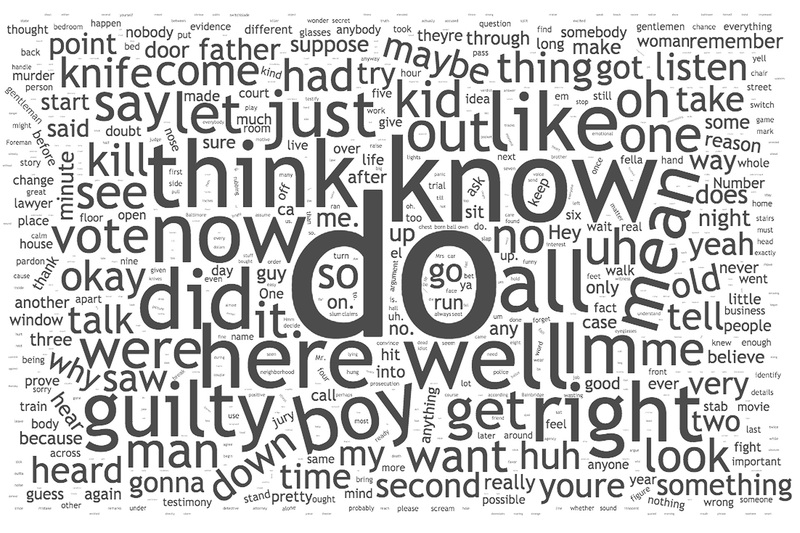 The result is below: a visual representation of the most common words in 12 Angry Men, for the loquacious or loose-lipped film analyst. It’s remarkable how the terms think and know are neck and neck: this is fitting for a movie that is about doubting the facts. (1) Hitchcock frequently railed against dialogue-heavy filmmaking. When interviewed by François Truffaut, for instance, he stated that “(…) we should resort to dialogue only when it’s impossible to do otherwise.” This short clip is another example of Hitchcock complaining about wordy films. (2) Arnheim, Rudolf. Film As Art. London: Faber and Faber, 1983, 185-187. (3) We found roughly a quarter of an hour of “silent” footage in the total 96 minutes runtime of 12 Angry Men. Needless to say, a lot of those shots were of Henry Fonda listening to the other jurors. (4) This video essay uses only shots, sounds and music from 12 Angry Men. With a single exception, no character is seen talking. The chronology of some shots has been changed from the movie, in order to make this montage adhere to the basic continuity rules of filmmaking. (5) If anything, this video essay proves the visual prowess of Lumet. It would however be interesting to see a similar exercise conducted with a movie by, say, Eric Rohmer or Woody Allen. Would their chatty pics pass this particular test? 12 Angry Men [feature film] Dir. Sidney Lumet. Orion-Nova Productions, USA, 1957. 96 mins.